環境・省エネビジネスは永遠です。 Eternal is environment, energy saving business. 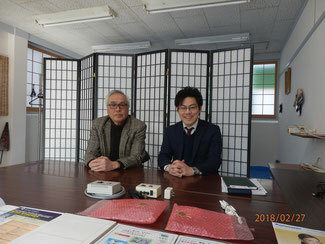 As the first thing this morning, I welcomed a business person of F Planning Research, Ltd. From Tokyo, talking about some basic matters regarding the environment and/or energy saving (technology). We enjoyed talking the off-the-job matters because he is a fan of Onomichi, visiting here before and I have some friends in Saitama where he was born. Both parties look forward to the future development.